Fall is on the way in Minnesota and that means great golf with the added color and light show in the woods. Crisp, cool weather, perfectly conditioned courses and fantastic foliage awaits a round of golf in Minnesota every fall. You just have to know when and where to find it. The Minnesota Department of Natural Resources puts out an annual Fall Color Map for all Minnesotans and visitors to this great state to follow the color trail as it starts at the north end of the state and quickly makes it way south. You can follow the colors and when they are estimated to hit their peak on the map and schedule your golf trip accordingly. And here is a quick guide to the golf in the area that provides some of the best “leaf peeping” to be found each fall. The colors begin changing in norther Minnesota first, and the trio of courses to hit is The Legend and The Quarry at Giants Ridge in Biwabik and Wilderness at Fortune Bay in Tower. All three course, known as the Norther Trilogy, were designed by Texas-based architect Jeffrey Brauer. The northern hardwoods with their brilliant reds, yellows oranges highlight three beautiful tracks carved out of the rugged Iron Range country. Head further south along the North Shore drive and the color viewing is unsurpassed at another pair of courses near Lake Superior shining in the east: Superior National in Lutsen and Black Bear Golf Course in Carlton. These courses are a short distance from Gitche Gumme, and when you are not walking their fairways, there is plentiful north woods hiking nearby to dive deeper into the fall colors. Head a bit further southwest and you will find a band of Minnesota golf resorts that offer incredible and varied golf challenges among the central lakes country of the state. From Minnesota National in McGregor in the east to several courses in central Minnesota (Madden’s on Gull Lake and Cragun’s Resort in Brainerd, Grand View Lodge in Nisswa, Breezy Point Resort in Breezy Point and Golden Eagle in Fifty Lakes) to Arrowwood Resort in Alexandra and Thumper Pond in Ottertail out west, imagine yourself strolling the green fairways with the panoply of vibrant colors overhead and a glistening blue lake nearby. The next color band south takes you to the Twin Cities courses and starts at the extreme northern edge of the metro with Territory Golf Club in St. Cloud, a links style course on the front nine that becomes a wooded walk through gorgeous hardwoods on the back nine. Drive an hour southeast and you can experience golf in one of the more gorgeous metro areas in the country. Fall’s tapestry of beauty can be enjoyed at Edinburgh U.S.A. in Brooklyn Park in the north, Rush Creek Golf Club (Maple Grove), Chaska Town Course (Chaska) and Braemar Golf Course (Edina) in the western suburbs and Prestwick Golf Club (Woodbury), StoneRidge Golf Club (Stillwater) and the brand new Royal Golf Club (Lake Elmo) in the eastern metro. The tapestry of colors will be alive and you will quickly forget that you are golfing in the Twin Cities. Finally, if you haven’t yet had the chance to break away for some incredible fall golf this season, the southern metro area has you covered. As the peak color-changing times head south, there are five great courses to choose from for fall adventure. 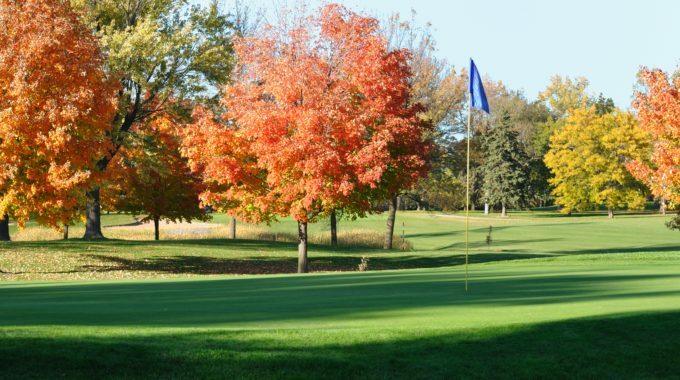 From suburban golf (The Wilds Golf Club and Legends Club in Prior Lake to small town beauties (Stonebrooke Golf Club in Shakopee, Ridges at Sand Creek in Jordan and Willingers Golf Club in Northfield), the opportunity for glorious fall golf surrounded by simmering color is plentiful. You need only check your schedule, consult the DNR fall foliage map and make a tee time. This multi-colored celebration happens once a year, and no fall golfer will want to miss it.